This is a New Year’s message to my fellow Americans and to America, it is not meant to dredge up past history, the past Century or, what we have been doing with our foreign policy; this message is meant to discuss what is happening NOW, over the past ten years and how America is accelerating towards a totalitarian regime that could remind us of the Soviet Bloc countries. What started as an ideal symbol of the highest hopes for humanity is light years away from where we are today. 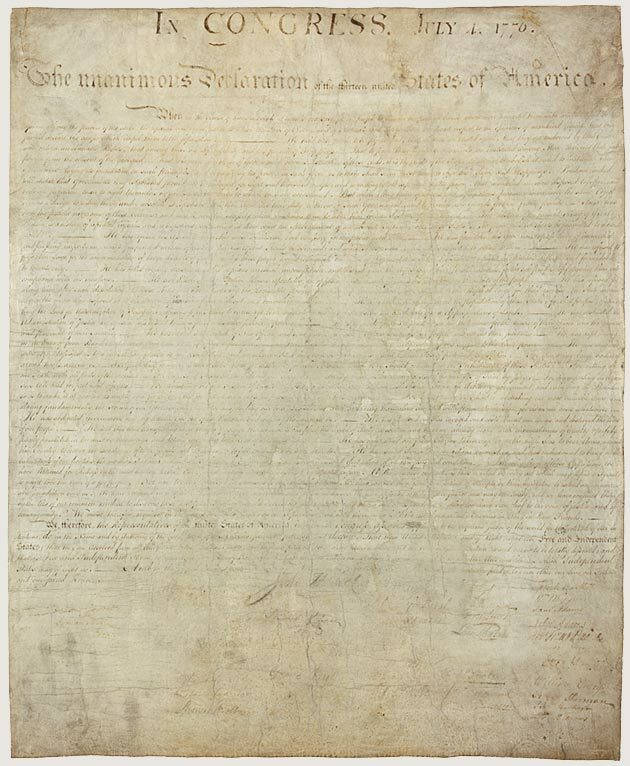 Back around 2003, I visited the Declaration of Independence at the National Archives and was disappointed that I could barely make out what it said and that too, only in a few places. Today, as I look back, I realize that it was allegorical for where America is today where our politicians are tossing the “Old” foundations of this country and replacing it as and how they will. Today: An entire Department of Homeland Security has been created with an untold number of employees whose job, disguised as “national security” appears to be, to target and persecute Muslims in America. Today: Military Tribunals, Ghost prisons overseas, Military prisons overseas, CIA prisons overseas and foreign Torture Chambers, all designed to persecute “suspects” (read “Muzlems“), legitimized by “pretended Legislation” permitting these outrages to the constitution of the United States. Today: The so-called “Military Tribunals”, which are neither according to Military laws, nor civil, where there is no jury trial, where evidence is kept secret as are charges and the “courts” only purpose appears to be, to find the Muslim defendants guilty, as evidenced by the fact that on the rare occasions when they are found innocent, they are sent back for re-trial…repeatedly, until they are found guilty. Today: Protests by Muslims subjected to harassment, targeting and unconstitutional persecution, have fallen on deaf ears, politicians have ignored the abuse of their own constituents and the American people have been barraged by messages of “threats to our security” in order to keep them from examining the abuses to their fellow Muslim Americans. Imprisoned without trails or charges, Muslim citizens and non-citizens in prisons, sometimes in Supermax prisons, which can lead to permanent psychological damage. Many Muslims are STILL in those prisons, many are in Guantanamo Bay prison even though they are known to be innocent. It is interesting that the Administrations have used the term, “no longer a threat” for people who cannot be proven guilty even in their kangaroo courts. Presumably, this term is to reduce liability on counter-charges of false imprisonment. Forced the relinquishing of citizenship a born US citizen under the threat of indefinite “detention” in Guantanamo Bay prison. Further forced the person to sign a declaration that he will not pursue the recovery of his citizenship or charge that he was under duress when he signed the papers. Ordered the murder of a Muslim US citizen overseas, without formal charges or even a show-trial. The US has asserted the “right” to “target and kill” (read “Murder”) suspects (Muslims) overseas. Of course, people can come forth with many “reasons” why such actions are necessary and how they do comply with the constitution, but those of us who have come here from tyrannies and dictatorships, are familiar with the patterns of tyranny and how tyrants justify their atrocities by saying they are defending national security…a most common excuse of every patriotic scoundrel everywhere. How does one evaluate a tragedy? should we say this is a tragedy because people are being made to suffer for who they are, instead of what they have done? Should we say this is a tragedy because of the extra-judicial acts of the government and the Administration? …or should we decry the posture of the people of the United States, who are holding fast to the principle of the Three Monkeys who See no Evil, Hear no Evil and Speak no Evil, against their country? 2011 is here and there are many things that will occupy our attention, our hearts and our actions; things like Healthcare, the Economy, Jobs, Industry, Schools, but the greatest focus we can have, is to make sure that every person in this country, is treated with the same protections as every other person; that we ALL have the same confidence in our future as free people in a free country. And of course, the five “War!”s that we are involved in (Iraq, Afghanistan, Yemen, Somalia and Pakistan). But aren’t we supposed to be fighting a “War!” against those who hate our Freedom? What Freedom do we have, when we can take it away as easily as we have done, from the least influential segment (Muslims) of our nation? As people of good will and as Americans, we MUST take a stand against the tyrants in our country and against those who stand silently and empower those tyrants. We MUST throw them out of office or at the very least, ensure that we have done everything WE can, to keep them out of office, whether they are from parties close to our hearts or not. Otherwise, we are not living a free life in a free country, we are living a hypocrisy in a tyranny.